Elvis Enthusiasts Unite: All Hail Sasquatch! Sasquatch seems like it was forever ago already, when it's really just been a couple of weeks. Work bogged me down so much I wasn't able to document the experience fully until now, but at least I got around to it. 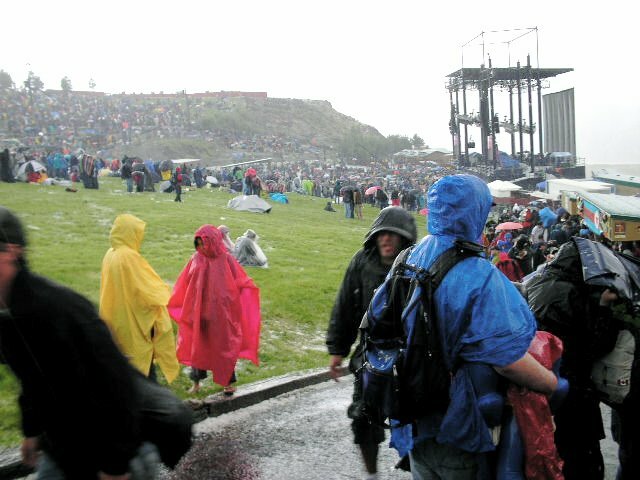 It was a whirlwind of great music, long lines, getting rained on, hailed on and sunburnt in the course of 2 and 1/2 days, surviving on trail mix and Slim Jims and, well, mostly enjoying the whole thing. I'm just glad I picked up that poncho at Wal-Mart on the way down. Best $5.88 I've ever spent, truthfully. I couldn't believe how good the line-up was on Saturday. 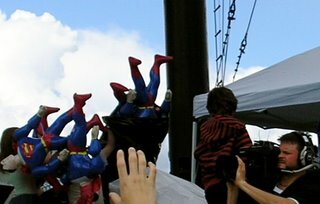 If you parked yourself at the main stage, you saw the following (in order of appearance): Rogue Wave, Gomez, Sufjan Stevens, Iron & Wine, Neko Case, The Tragically Hip, Ben Harper & The Innocent Criminals and The Flaming Lips. We pretty much did that. Save for the hail, it was a glorious 12 hours or so. 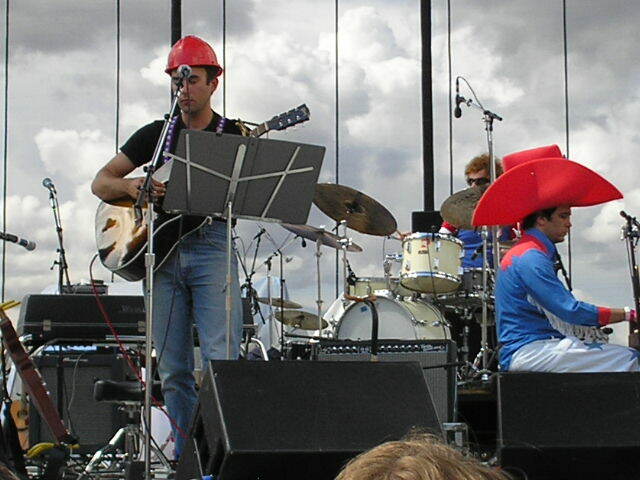 And Sufjan was a large part of it all, faulty American-flagged suspenders notwithstanding. They kept popping off, but the band played on. There were many, many inflatable Supermen (Supermans?) thrown into the audience during "The Man of Metropolis Steals Our Hearts" ... and I didn't get a one of them. Some grabby uber-fan next to me did, though, and I spent the next six hours quietly despising him. 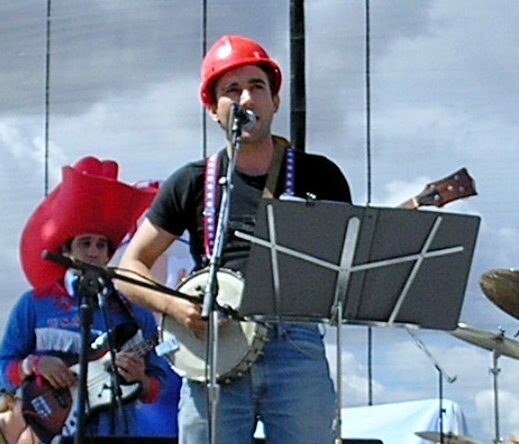 How much do I love you, Sufjan? 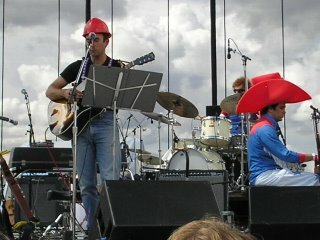 I love you so much, I'm willing to rock this incredibly silly HUGE cowboy hat and white pants, while playing the piano. I won't look like I'm happy while I'm doing it, though. But the Cowboy Curtis combo? I'll wear it, but I don't have to like it. So there. I lasted exactly three songs a few rows away from Sammy Beam and his sister. I'd like to place blame on a bad back as it'd been a few hours, but I now believe it's simply Iron & Wine's effect on my body. Hearing the strumming and the quiet automatically makes me want to lie down in the grass, close my eyes and soak in the atmosphere a touch. And that's exactly what I did. This was that 45-minute hailstorm that stopped everything for a bit. I was crammed up against a wooden fence with my buddy Matt as it came down. Hard. In no time, we were standing in a river. 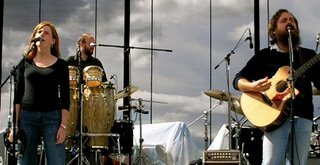 I suppose we saw what true music fans are made of that afternoon. The stalwarts (and, admittedly, the drunks) stayed and stuck it out, opting to slide down the wet hills in the ponchos and such. The rest fled the scene. It made for some real mud the next day but we still got to see what we came to see. If they can match this lineup next year, I'll start making a hole in my schedule, even if it means driving 1510 miles there and back all over again. I highly recommend you do the same. If you live around here, we'll carpool. It's as easy as that. And in case you missed it before, you can find the whole meandering wrap-up here. In addition, you can see any of the performances by heading this way. Enjoy. several of my friends have posted reports of festival shows so far this summer but this looks like, by far, the best one. I envy. I haven't been out to this kind of thing since the Horde tour used to make its rounds through "parkwest", I mean "wolf mountain", oh wait, I mean "the Canyons"? anyway, glad you had fun and stayed dry. I think it will be hard to top. 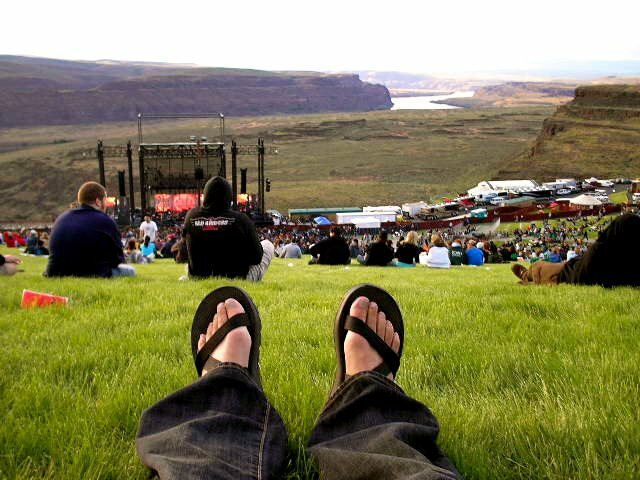 Coming up, tho, are Austin City Limits, Pitchfork and Bumbershoot. Let's hope I can do with the arm and leg it cost me to get flights to alla those places. Sheesh.